Working on the checkouts at one of our major supermarkets I can't help but notice just how much money people seem to spend on food. It astonishes me to see baskets go through where folk are spending what amounts to my entire weeks food budget (and sometimes entire month ) on a single office takeaway lunch for one let alone a proper family meal. 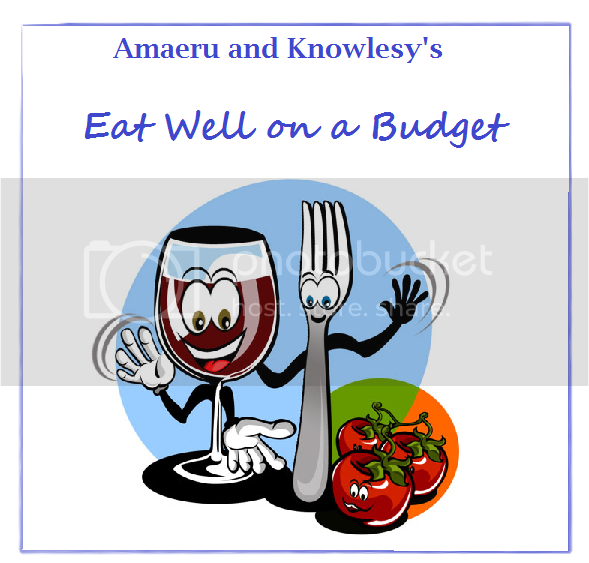 Since K and I are both a bit what you might call......well....... skint we've got used to managing on a very small food budget. And it occured to us that so are a lot of us here. And I bet we all have amazing recipes and money saving tips to share. Ways of making ingredients go further. Ways of making great food from a few simple ingredients. Budget versions of great food. With a little thought and canny budgeting eating cheaply doesn't have to mean living like a student on beans and pot noodles. In fact these days living on beans and pot noodles is becoming an expensive luxury. Have you seen what they are charging for a branded tin of beans these days!!!!!! We'll try to post something here every day whether it's a recipe a tip or just a link to something great I've found out there in Interwebland. Please everyone feel free to contribute. Loving that blog! It's not one I've seen before! D'you know what I got absolutely mad last week when one of the mums was talking to the lollipop lady who was saying how skint she was that she only had £5 to last her the week for food etc, "so it'll have to be pot noodles all week"...I was gobsmacked! Pot noodles are REALLY expensive and you could eat so much better with pasta! I've made this a sticky thread so it'll stay at the top because I think it's going to be such a brilliant resource for us all! I've been behind people and been similarly stunned! Tip one......Who's afraid of budget lines????? I still can't belive that people pay £1 and upwards (sometimes even £1s) for fancy brands of pasta. Now unless you have dietry requirements such as gluten free etc there is absolutely nothing wrong with budget dried pasta. It's only flour and water (and sometimes egg) and it all hydrates just the same when you boil it. And honestly ... better some properly cooked al dente budget pasta than some over boiled posh stuff. The secret to great pasta isn't how much you paid for your staple item but cooking it in a big enough pan for it to be able to move about in water brought to a vigorous rolling boil before you add the pasta. Cook it until it's al dente - apparently the softer you cook it the higher the glycemic index which might be relevant to some such as diabetics and the insulin resistant. A pack of budget range spaghetti can be picked up in most supermarkets for around 19-24p. Same goes for rice. Now I know some recipes work best with particlar varieties like arborio for risotto for example. But for most basic day to day needs a budget long grain rice - approximately 40p a kilo is just fine. Tinned tomatoes - per-leaaase have you seen what they charge for those. Honestly the savers ones are just as good. And if you check out own brand Passata you can get a 400g carton of sieved tomatoes with a far higher percentage of tomato content that your branded tins. These make a great base for any number of soups, sauces and stews. Just add herbs and spices and your choice of meat or veg. And speaking of meat - a little really can go a long way. Bulk out those sauces with healthy veggies and beans, grain and pulses. Spices - arrrrgh don't get me started. Those little bottles containing about 15g and costing £1-2 pounds. Forget em. Don't even bother picking up the refill pack which work out a little cheaper but not noticeably so. No - if you want to use a lot of herbs and spices -and if you want to eat really well on a budget you will be using a lot - buy those 100g bags you find in the ethnic food aisle. In fact I'd heartily recommend checking out the world foods aisle. You'd be amazed what bargains you can pick up when it comes to basic store cupboard staples. Lastly be sure to check out the reduced sections. If you shop toward the end of the day amazing bargains can be found. Especially if you are lucky enough to have a store that makes fresh produce on site. Usually all perishables have to be reduced and sold ahead of their sell by date. At my place it is regularly possible to pick up loaves of freshly baked bread (often speciality lines too) for as little as 19p. Meats and fish can be bought at times like this in larger quantities than needed and as long as it's frozen straight away on day of purchase will keep just fine. If you live alone or only one member of your family is a meat eater you can still take advantage of these bargain bulk buys. Split the packs when you get home and freeze them in portions in freezer bags. Then you only need to defrost what you need at the time. Be sure to write the date on the bags though so you can properly rotate the contents of your freezer and use the oldest items first. Simplify, simplfy, simplify. Most cookbook recipes use far more ingredients than are strictly necessary. It doesn't hurt to skip a few, replace something you don't have with something you do, or adapt a recipe for the bits and bobs you have lying at the bottom of your cupboard or fridge. If you have rice, pasta, onions, tinned tomatoes and beans you can always throw something together. If you have a few herbs and spices you can make a simple base taste like something our less frugal neighbours have spent a small fortune on. Last edited by amaeru; 08-02-14 at 07:09 AM.